62. Know what to do it you encounter an injured bird on the highway. 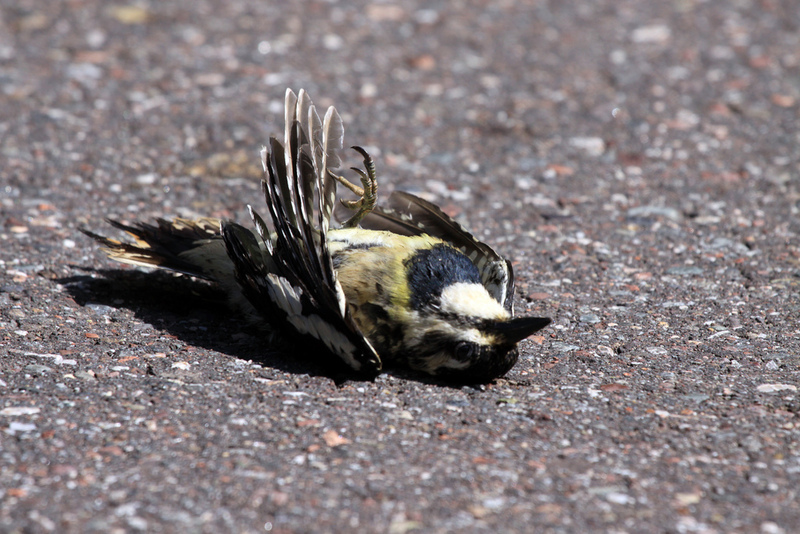 Most birds struck by cars die very quickly, but some survive for a while. Injured, struggling birds along a highway can distract drivers, leading to accidents. In many cases, the bird’s injuries are too severe to be repaired by even the finest rehab facility, but other birds, if given prompt treatment, can make a complete recovery. When dead and dying birds are left along roadsides, they attract predators and scavengers, which in turn can be hit by cars. A paper bag or box big enough to comfortably hold the bird with little room for maneuvering is the simplest way to transport an injured bird. Lining the bottom with paper towels gives the bird’s feet something to grip; even better is a piece of Astroturf. Keep assorted paper bags, a few paper clips, and a roll of paper towels in your car at all times. A pair of heavy leather gloves is essential when dealing with a raptor. Latex gloves can protect your hands from germs when handling a smaller bird. A kitchen towel tossed over a small bird can make capture simpler. A large bath towel works for larger birds. A roll of 3M Vet Wrap (for humans, the same product is called 3M Coban) can come in handy to hold up a badly injured wing so it doesn’t dangle, leading to more damage during transport. Organize these materials in a medium-size cardboard box, which can be used if you encounter a bird too large or strong for a paper bag. Keep the telephone numbers of the nearest wildlife rehabilitation facility, the department of natural resources, and the state highway patrol stored in your cell phone, but also write them conspicuously on the box, just in case. You may never need this rescue kit, but you’ll be glad you have it if you do encounter an injured bird. 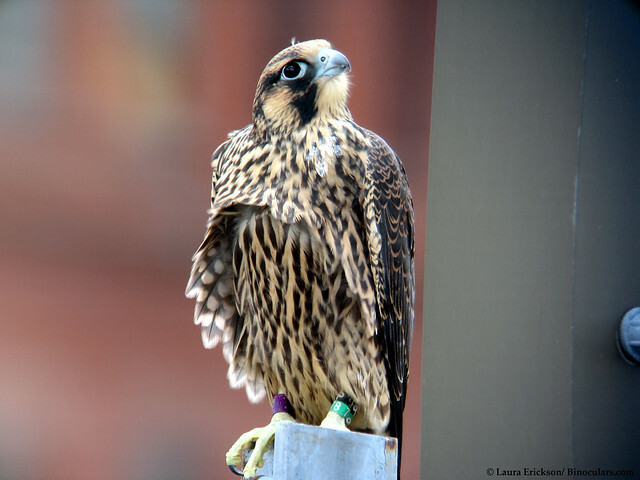 Having a large bath towel in my car was a godsend when I came upon a grounded Peregrine Falcon fledgling in downtown Duluth. She needed just a little assistance to get back to the roof where her nest box was. A week later, she was flying over the city in perfect form. When you discover a hurt bird along the road, the first thing you must do is to make a virtually instantaneous assessment of the traffic situation. If you’re on a quiet country road, there probably won’t be a problem pulling over. If you’re on a busy interstate highway going through a city during rush hour, you shouldn’t even think of pulling over. Most other situations require you to assess the risk and make a decision. When the situation is too dangerous to stop your car, ask one of your passengers to use a cell phone and call a rehabber and get help there as soon as possible. Most rehab facilities have developed protocols for working with the highway patrol to safely remove struggling animals from roadsides. However, many highway patrol officers and police, and even some conservation officers, don’t know how to deal with injured animals. 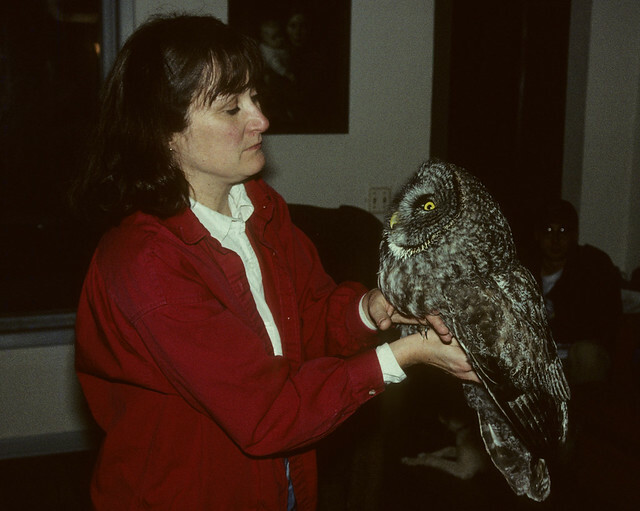 In northern Minnesota, some birders noticed a hurt Great Gray Owl alone a narrow, winding road; they drove a quarter mile to a driveway where they could safely turn around to go back and rescue it, but they were just seconds too late; as they approached, a sheriff pulled over and shot the bird. The first priority for law enforcement is to prevent humans from being injured, and that’s where their training is focused. So when you find injured wildlife, it’s best to notify wildlife rehabbers first. They’ll know which authorities to call. If you can find a safe place to stop, pull over and turn on your emergency flashers. The next issue is getting the bird from the roadside into the bag or box. If possible, it’s best to have two people approach the road from different directions; that way, if the bird tries to flee, it will be running away from traffic rather than toward it. Your goal is to toss a towel over the bird and then, wearing gloves if the bird may have strong claws, talons or beak, scoop the bird up, place it in the bag, roll it closed, and secure it with paper clips. You do not want a bird fluttering around your car while you’re driving! With a sparrow or warbler in a paper sandwich bag, just folding the top down may be enough, but a paper clip provides more insurance. If a wing is dangling and the bird isn’t struggling too hard, you can try to gently set the wing against the body, as well matched to the other wing as possible, and roll Vet Wrap or a towel around the bird to hold the wing in place. Be careful not to wrap too tightly—birds breathe using air sacs that fill many spaces in their bodies, and wrapping too tightly can cause suffocation. If you’re uncertain about doing this, it’s better to leave the wing and just get the bird into the bag. If possible, drive directly to a rehab facility. The people there will need to know your name, the date and place where you found the bird, and what caused the bird’s injuries, if you know. Rehab facilities aren’t allowed to charge a fee for taking birds, and they get no government funding except, in rare cases, for specific research or conservation projects, They depend on contributions from donors like you.